A quiet bunny sits patiently, guarding her secret. 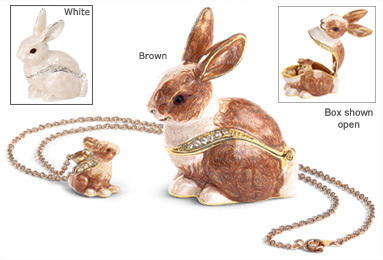 This pretty little rabbit is actually a box - open it to reveal a tiny baby bunny pendant! Enameled pewter box and pendant are both highlighted with sparkling Austrian crystals. Hinged box has magnetic closure. 2 1/2" high. Pendant on 19" gold-tone chain. Choose Brown or White. Giftboxed. Sorry, brown no longer available. I liked it so much I purchased another one..recently rescued a young white bunny ..so very fitting! We bought this for my sister-in-law for Christmas. We were surprised by the quality of the box and necklace. She really liked the pair for her Christmas gift. My sister collects what I call "rabbitiana". She was thrilled to see the little case and was even more thrilled to discover and wear the bunny pendant. Nice job on giftwrap and very prompt delivery even with regular mail. It brought the biggest smiles!! I got the Bunny Box and necklace for my granddaughter for her 11th birthday. She just loved it. I purchased this as a gift for my wife. She collects bunny jewelry, accessories and home decor. She will love this present. It is very nice and a very good value. This is going to be a gift for my bunny-loving friend, and she is going to squee when she sees it. So cute and clever. This is a top rating for me. This box with the little bunny pendant is so beautiful. I got the brown one and could not be more pleased. Thanks for the great service.